House Democrats' Campaign Chief Likes Party's Chances For Retaking Control : It's All Politics Rep. Steve Israel, the New York Democrat who chairs his party's congressional campaign committee, had more reasons to sound upbeat in a conversation with All Things Considered co-host Melissa Block than he might have had only a few months ago. Rep. Steve Israel, the New York congressman who chairs the Democratic Congressional Campaign Committee. The lawmakers who are chosen to lead their party's efforts to pick up seats in Congress seem congenitally wired to exude confidence about their prospects. That's why their colleagues chose them to play that role, in the first place. So it's usually wise to discount their optimism to some degree. 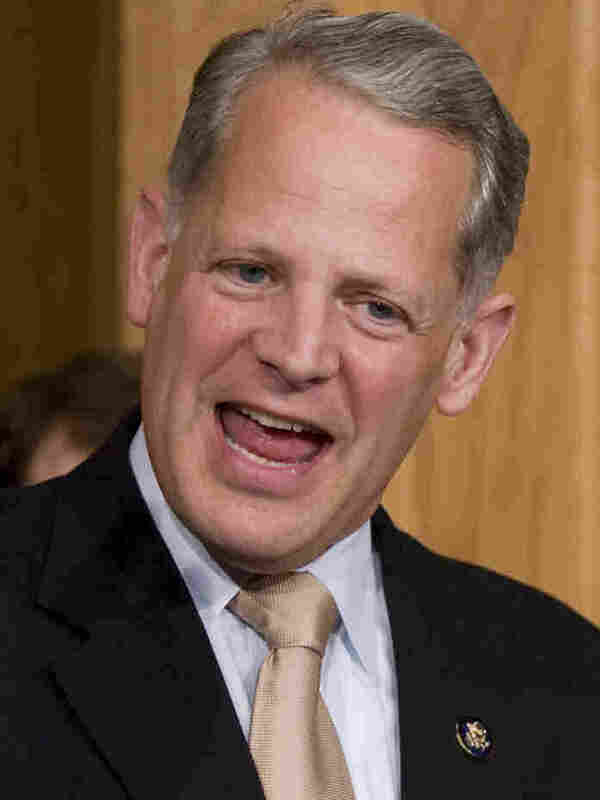 Still, Rep. Steve Israel, the New York Democrat who chairs the Democratic Congressional Campaign Committee, had more reasons to sound upbeat in a conversation with All Things Considered co-host Melissa Block than he might have had only a few months ago. House Democrats, for instance, outraised their Republican counterparts in the third quarter $14.2 million to 10.7 million. Still, On the way to losing majority control of their chamber, House Democrats lost 63 seats in 2010. To regain sway over the House, they would need to pick up more than two dozen seats. That's a lot of ground to make up and a number of political analysts have doubted they could do so. MELISSA: You'd need to pick up 25 Republican seats if you're going to get back the majority. It's pretty daunting. How do you get there? ISRAEL: Well, actually, it's not that daunting. Look, we did get shellacked we got thumped in 2010. And as a result of the fact that we have fought back, we are in line to take the House back, the House is in play. We have outraised the House Republican by almost $4 million, year to date. That is unprecedented that the party in the minority would outraised the Republicans. We have out-recruited them. We have 60 districts filled with strong recruits in competitive races and we only need 25. And the reason for those successes quite honestly is not just that we're that good but that the Republican voting records are that bad. There's buyers' remorse that has set in among voters throughout the country because of the House Republicans' voting record, because of their extremism. That's why we believe we have a shot at taking back the House. Israel's interview is complemented by a piece by Andrea Seabrook, also on All Things Considered, which reported on the less-than-impressive fundraising results of House Republican freshmen like Rep. Renee Ellmers of North Carolina. REP. ELLMERS: Well you know I did have a slow third quarter, I definitely could have done better. ANDREA: North Carlina's Renee Ellmers. For the months of July, August and September, she raised roughly $97,000. REP. ELLMERS: It wasn't as high a priority for me, I will say that my fourth quarter will be much better though. REP. ELLMERS: I have to work it. I have to work it. ANDREA: Ellmers says she's gotten a lot of advice in the week since her numbers came out. Mentors, she says, explaining to her that she has to work much harder. REP: ELLMERS: That's quickly one of the things that I noticed when I got here.